This Sunday I finished hike number 27/52 for the 52 Hike Challenge in 2015, and have now completed 318 of my goal of 1000 miles for this year. The weather has been unusually foggy and cool all week. It’s come as a bit of a surprise, as we’re used to having warm weather for Memorial Day, the unofficial ‘kick-off’ for Summer. Julia and I decided to hike San Gorgonio via Vivian creek, which is a hike just shy of 18 miles that gains 5500 ft to the 11,500 foot summit of San Gorgonio. We stopped at the Mill Creek ranger station at about 8:30 to pick up our permits. We were preparing for poor weather as the rain began falling on us in the ranger station parking lot. We drove east to the trailhead in Forest Falls, and much to our surprise, drove up and out of the rain as we gained elevation. By the time we were driving through Forest Falls, the skies were clear and bright with puffy white clouds, and moderate temperatures in the 40s. There were a lot of rangers in the parking lot preparing for the Memorial Day crowds that like to hang out at the campground and nearby creek. Luckily for us, there were very few people there early. We grabbed our packs, readied our trekking poles, and hit the trail. The rain we’ve received in the area has made the first few miles of Vivian Creek trail a real feast for the eyes. It was a real joy to pass through the wilderness undisturbed, and allow my mind to take in all of the brilliant shades of green. The first mile of Vivian Creek Trail climbs very steeply, with around 1000 ft in the first mile. After this, it levels out for a while. This flatter section is one of the most enjoyable on the trial. After a few miles, we passed the junction for High Creek, which is an offshoot that leads to a pretty nice low elevation camping site. We didn’t stop, but could see about 5 tents in the area making the most of the long Memorial Day weekend. After about four miles, when the trail becomes a series of switchbacks to the high camp, the weather started to change a bit. There was a lot more cloud cover blowing in from the east, and we could begin to see the low hanging canopy of clouds blanketing the valley. We were being sandwiched in between. 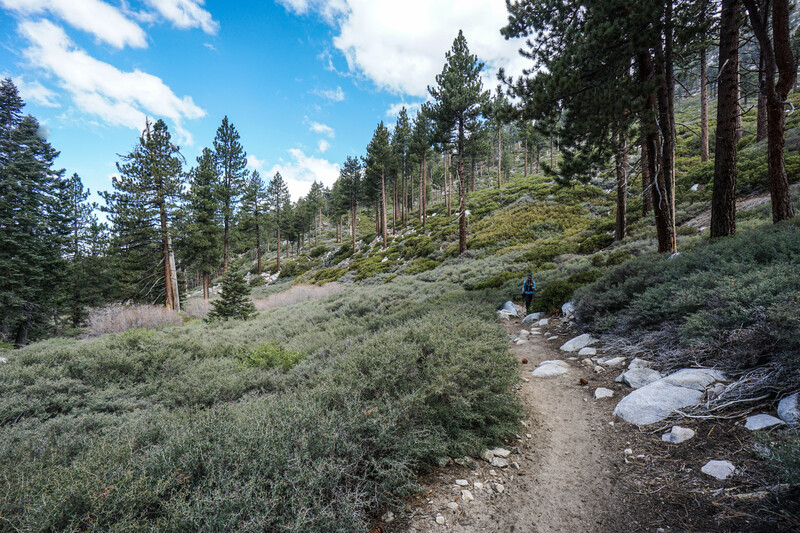 After the switchbacks, the trail passes 10,000 ft of elevation and climbs steeply to the summit of San Gorgonio at 11,500. At a lower elevation, this would be an easy hike, but the thin air seems to get me every time. We hadn’t seen very many people on the hike up to this point, but as we approached the final mile, staggering hikers began to appear in front of us. We reached the peak of San Gorgonio after more than 4 hours of hiking, and caught the last glimpse of fleeting views being eaten by clouds on the summit. There were quite a few hikers taking in the Southern California sights. I’ve been up at the top with crystal clear views many times now, so it was pretty cool for me to have clouds flying by and washing over me. We made our way down the same way we came and were quite happy when the clouds began to clear to allow for the warming sun. In all, it was an incredible hike. It wasn’t the warm Memorial Day weekend weather we’re accustomed to, but we have all summer to enjoy the heat. I’m sure I’ll be back out on Vivian Creek soon to take in some of the best views in Southern California. Are the signs usually on the ground at the summit? If they did that in NH they would be stolen:( Beautiful photos as usual! Most summits have the signs posted or just use a geodetic marker. San Gorgonio is the only one I can think of that has an unattached plank of wood 🙂 Hopefully no one ever takes it! What a great hike! I love this time of year when everything is so lush and green. Did you have to drive far? I’d love to hike more at higher elevation but have to drive from CT to VT or the Adirondacks, which means a weekend away. Your photos are amazing. Thanks! I’m incredibly fortunate to be less than an hour drive from many 10,000ft peaks, and only 3 hours from the Eastern Sierra! Hi this is awesome, I went for a small hike to forest falls, saw the waterfall and fell in love, how did you get started and what are dos and fonts for starters. I would love to do the challenge.